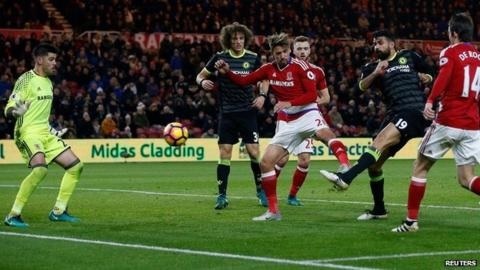 Diego Costa's 10th goal of the season moved Chelsea top of the Premier League as their sixth straight win saw off Middlesbrough at the Riverside Stadium. After an even start, Chelsea upped the tempo and deservedly led at the break when Costa reacted quickest to drill in a loose ball inside the Boro box. The Blues continued to create chances, Pedro going closest when he smacked a rising drive against the crossbar. Boro's best chance came when Alvaro Negredo's 78th-minute volley was saved. It was the only time the home side forced Blues keeper Thibaut Courtois into a serious stop as they lost for the first time in four matches. Chelsea leapfrogged Liverpool and Manchester City to go a point clear, while Boro remain one point above the relegation zone in 15th place.